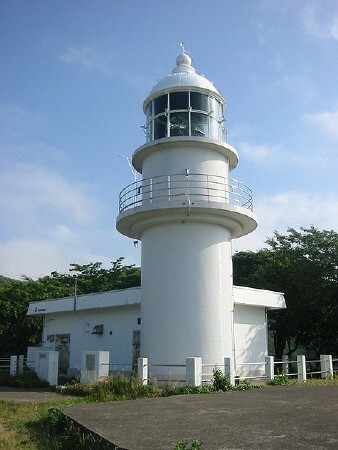 This page lists lighthouses of the Sea of Japan coast of Honshū, including Tottori Prefecture and the north coast of Hyōgo Prefecture (known historically as Tajima). (Hyōgo spans the island of Honshū and has a south coast on the Seto Inland Sea; lighthouses of that coast will be found on the Kōbe and Akashi, Himeji Area, and Awaji Shima pages.) This is a rugged and beautiful coast, with many small ports but only a few big ones. Sakai (Sakaiminato) in far western Tottori Prefecture is the most important. In Japanese, the word for a lighthouse is tōdai or toudai (灯台). The words saki and misaki are for capes and headlands, shima (also spelled sima or jima) is an island, wan is a bay, and kō is a harbor. Lighthouses in Japan are operated and maintained by the Japanese Coast Guard's Maritime Safety Agency. On Honshū there is usually at least one Coast Guard Section Office in each prefecture, often two or more. In Tottori there is one office at Sakaiminato; lights on the rather short coast of northern Hyōgo are maintained by the office at Maizuru in neighboring Kyōto prefecture. A comprehensive site, although almost entirely in Japanese. This site has many excellent photos of Japanese lighthouses. Search for lighthouses by names or JCG numbers, which are in English. 1982. Active; focal plane 18 m (59 ft); white, red or green light, depending on direction, shown only along or close to the range line; also a yellow light, 1 s on, 1 s off. 20 m (66 ft) round cylindrical tower, painted with red and white horizontal bands. Lighthouse-Japan.com has a page with good photos, FOAL's page has several photos, Lighthouse Visit also has a page, Kiso has a photo, another good photo is available, and Google has a street view and a satellite view. The range guides vessels in the channel separating Sakai from Jizo Saki in Shimane Prefecture. Located on the waterfront about 600 m (3/8 mi) west of the Mihonoseki Bridge (seen in the background of Kiso's photo). Site open, tower closed. JCG-0901; Admiralty M7296; NGA 2184. 1991 replica of 1895 lighthouse. Inactive (?). 9 m (30 ft) hexagonal wood tower with lantern and gallery. Lighthouse painted white. A photo is at right, Kiso has a photo, FOAL has a photo (bottom of the page), a 2016 photo is available, and Google has a street view and a satellite view. The original Sakai lighthouse, demolished in 1965, was a shorter version of an 1877 lighthouse near Ōsaka, which by coincidence is also called Sakai Light. The replica is located in a small park just off the waterfront of the channel separating Sakai from Jizo Saki, about 200 m (220 yd) west of the Mihonoseki Bridge. Site open, tower closed. ARLHS JPN-527. Date unknown. Active; focal plane 13 m (43 ft); white light, 3 s on, 3 s off. 14 m (46 ft) round concrete tower with lantern and gallery. Entire lighthouse is white. A photo is at right, Lighthouse-Japan.com has a page with several photos, Kiso has a photo, the Coast Guard has a photo (second photo on the page), another photo is available, FOAL's page and the Lighthouse Visit page have photos of both breakwater lights, and Google has a satellite view and a distant street view. Sakaiminato is located on a broad spit separated from the Jizo Saki peninsula by a narrow channel that is the inlet to a protected lagoon behind the spit. The channel is the border between Tottori and Shimane Prefectures. Located at the end of a short jetty (not really a breakwater) on the south side of the inlet. Site and tower closed, but the lighthouse can be seen easily from shore. ARLHS JPN-322; JCG-0897; Admiralty M7294; NGA 2180. Date unknown. Active; focal plane 16 m (52 ft); green flash every 3 s. 14 m (46 ft) round concrete tower with flared top and gallery. Entire lighthouse is white. Lighthouse-Japan.com has a photo, FOAL's page and the Lighthouse Visit page have photos of both breakwater lights, and Google has a satellite view and a distant street view. This light is actually southeast of the so-called South Breakwater Light, and the main entrance to Sakai harbor is between the two lights. Located at the north end of the detached outer breakwater of Sakai. Accessible only by boat. Site and tower closed. ARLHS JPN-527; JCG-0897.4; Admiralty M7294.5; NGA 2182. 1955. Active; focal plane 13 m (43 ft); green light, 2 s on, 2 s off. 9 m (30 ft) round concrete post attached to a 1-story concrete equipment building. Entire lighthouse is white. Lighthouse Visit has a page for the light, and Google has a satellite view and a distant street view. Located at the end of the north (main) breakwater of Yodoe harbor, at the east end of Miho Bay. Accessible by walking the pier. Site open, tower closed. ARLHS JPN-1601; JCG-0921; Admiralty M7293.5; NGA 2216. 1970. Active; focal plane 15 m (49 ft); red light, 2 s on, 2 s off. 10 m (33 ft) round concrete post attached to a 1-story concrete equipment building. Entire lighthouse is red. Lighthouse Visit has a page for the light, and Google has a street view and a satellite view. Located at the end of the north (main) breakwater of Misaki harbor, at a prominent cape in central Tottori. Accessible by walking the pier. Site open, tower closed. ARLHS JPN-1591; JCG-0924; Admiralty M7292; NGA 2224. Date unknown. Active; focal plane 15 m (49 ft); red flash every 3 s. 9.5 m (31 ft) round concrete post attached to a 1-story concrete equipment building. Entire lighthouse is red. Lighthouse Visit has a page for the light, and Google has a satellite view and a distant street view. Located on the west outer breakwater of Akasaki harbor in Kotoura. Accessible by walking the pier. Accessible only by boat. Site open, tower closed. ARLHS JPN-1597; JCG-0925; Admiralty M7290.2; NGA 2232. 1972. Active; focal plane 35 m (115 ft); white flash every 4 s; also a continuous white spotlight (JCG-0928) illuminates a nearby reef. 10 m (33 ft) round concrete post centered on a 1-story concrete equipment building. Entire lighthouse is white. Lighthouse-Japan.com has a page with several photos, Lighthouse Visit also has a page for the light, another photo is available, Misty's Tour has a small photo, and Google has a satellite view. Located on heights above the waterfront at Tomari, in Yurihama about 25 km (15 mi) west of Tottori. Site open, tower closed. ARLHS JPN-668; JCG-0927; Admiralty M7289.2; NGA 2236. 1991 (station established 1927). Active; focal plane 68 m (223 ft); white flash every 8 s. 13.5 m (45 ft) round cylindrical concrete tower with lantern and gallery, attached to a 1-story equipment shed. Entire lighthouse is white. 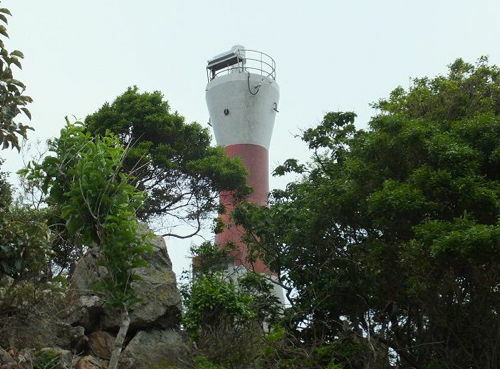 S. Morita's 2014 photo is at right, Lighthouse-Japan.com has a page with several photos, Lighthouse Visit also has photos (lower half of the page), Kiso has a good closeup, another photo is available, and Google has a satellite view. The station is surrounded by the Nishiinaba Prefectural Natural Park. Located on a sharp, isolated promontory about 3 km (2 mi) northeast of Aori; this cape is a significant hazard to navigation along the coast. Accessible by an unsealed road; parking provided. Site gated, but the lighthouse can be seen from nearby. ARLHS JPN-389; JCG-0934; Admiralty M7289; NGA 2256. 1957. Active; focal plane 59 m (194 ft); white flash every 3 s. 7.5 m (25 ft) round concrete post attached to a 1-story concrete equipment building. Entire lighthouse is white. Another photo is available, Lighthouse Visit has photos (lower half of the page), and Google has an indistinct satellite view. Located atop a steep hill southeast of the harbor of Sakenotsu; the coastal highway tunnels under this hill. Site open, but the author of Lighthouse-Japan.com had trouble finding it; tower closed. ARLHS JPN-531; JCG-0938; Admiralty M7288.6; NGA 2264. 1983. Active; focal plane 32 m (105 ft); white light, 3 s on, 3 s off. 11 m (36 ft) round concrete tower with a flared top, attached to a small equipment shelter. Entire lighthouse is white. Lighthouse-Japan.com has a page with good photos, Lighthouse Visit has photos (halfway down the page), another photo is available, and Google has a distant street view and a satellite view. Wataru Kishimoto's photo shows the steep approach to the lighthouse. Located on a rocky islet just off the waterfront of Tottori. Accessible with caution over breakwaters extending from the west quay. Site open, tower closed. ARLHS JPN-682; JCG-0939.5; Admiralty M7287.5; NGA 2276. Date unknown. Active; focal plane 17 m (56 ft); red flash every 4 s. 12 m (39 ft) round hourglass-shaped concrete tower. Entire lighthouse is red. Lighthouse Visit has photos (top of the page), and Google has a satellite view. Located at the end of Tottori's outer breakwater. Accessible only by boat. Site and tower closed. ARLHS JPN-1598; JCG-0938.9; Admiralty M7287.7; NGA 2280. 1990. Active; focal plane 13 m (43 ft); continuous green light with a more intense flash every 4 s. 8.5 m (28 ft) round hourglass-shaped concrete tower. Entire lighthouse is white. Lighthouse Visit has photos (bottom of the page), and Google has a satellite view. Located at the end of Tottori's east breakwater. Accessible only by boat. Site and tower closed. ARLHS JPN-1596; JCG-0941; Admiralty M7287.6; NGA 2286. 1950. Active; focal plane 105 m (344 ft); white flash every 12 s. 11 m (36 ft) round concrete tower with lantern and gallery. Entire lighthouse is white. A photo is at right, Lighthouse-Japan.com has a page with good photos, Lighthouse Visit has photos (halfway down the page), FOAL also has a page with photos, Misty's Tour has a photo, another photo is available, and Google has a satellite view. Located on a promontory about 12 km (7.5 mi) northeast of Tottori. Accessible by a hiking trail, but parking is very limited. Site open, tower closed. ARLHS JPN-038; JCG-0946; Admiralty M7286; NGA 2296. 1950. Active; focal plane 33 m (108 ft); white light occulting once every 4 s. 9 m (30 ft) round concrete post centered on a 1-story concrete equipment building. Entire lighthouse is white. Lighthouse-Japan.com has a page with several photos, Lighthouse Visit has photos (top of the page), the FOAL page for Tajiri has photos, another photo is available, and Google has a satellite view and a very distant street view. Located on an islet protecting the harbor at Tajiri, about 15 km (9 mi) northeast of Tottori; the islet is accessible from the town's main breakwater. Site open, tower closed. ARLHS JPN-636; JCG-0947; Admiralty M7283.9; NGA 2308. Date unknown. Active; focal plane 14 m (46 ft); red flash every 3 s. 9 m (30 ft) round concrete post attached to a 1-story concrete equipment building. Entire lighthouse is red. The FOAL page for Tajiri has photos, Lighthouse Visit has photos (bottom of the page), and Google has a satellite view. Located on a rocky reef just beyond the end of the main Tajiri breakwater. Accessible only by boat. Site open, tower closed. ARLHS JPN-1599; JCG-0949; Admiralty M7283.94; NGA 2316. Date unknown. Active; focal plane 75 m (246 ft); white light, 4 s on, 4 s off. 7.5 m (25 ft) round concrete tower, attached to a 1-story concrete equipment room. Entire lighthouse is white. A closeup photo is available, Lighthouse Visit has a page for the lighthouse, FOAL has distant views, and Google has a satellite view. Located on a promontory about 3 km (2 mi) northeast of Tajiri. The road to the lighthouse is reported closed, and access to the site is difficult. Site and tower closed. ARLHS JPN-449; JCG-0950; Admiralty M7283.85; NGA 2320. Note: Hyōgo Prefecture spans the width of Honshū. The northern portion of the prefecture, facing the Sea of Japan, was known historically as Tajima. Lighthouses of Hyōgo's southern coast, on the Seto Inland Sea, are listed on the Kōbe Area, Himeji Area, and Awaji Shima pages. Date unknown. Active; focal plane 66 m (217 ft); white flash every 5 s; also a continuous white spotlight (JCG-0952) illuminates a nearby reef. 11 m (36 ft) round cylindrical concrete tower. Entire lighthouse is white. A distant view is available, and Google has a satellite view. Located atop a rocky islet off the waterfront of Ikumi. Accessible only by boat. Site and tower closed. ARLHS JPN-1499; JCG-0951; Admiralty M7283.8; NGA 2328. Date unknown. Inactive. 10 m (33 ft) concrete post attached to a 1-story concrete equipment shelter. Entire lighthouse is white. Lighthouse Visit has a photo (top of the page), and Google has a distant satellite view. The Lighthouse Visit webmaster has confused this light with the previous entry. Located at the end of a rocky reef that forms a natural breakwater northwest of the main Ikumi light (previous entry). May be accessible only by boat. Site status unknown. Not listed by JCG or by the Admiralty. 1986 (station established 1956). Continuous white spotlight illuminates a nearby reef. 9 m (30 ft) round cylindrical concrete tower. Entire lighthouse is white. Lighthouse-Japan.com has a page with good photos, Lighthouse Visit has a page with photos (top of the page), Kiso has a closeup, Misty's Tour has a small photo, and Google has a satellite view. Photos of the first and second lighthouses are available (first lighthouse at the top of the page). 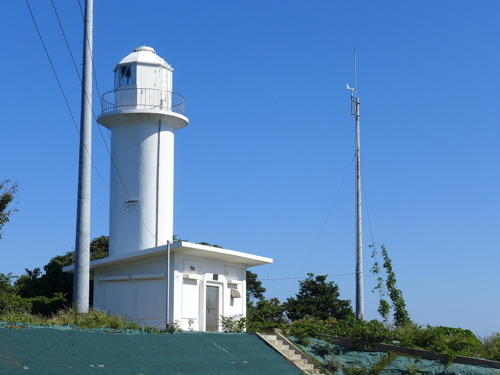 The general purpose light at the top of the tower was deactivated in 2011 (ex-JCG-0955, ex-Admiralty M7283.6), but the spotlight remains active. Located on the heights above the harbor of Moroyose. Accessible by a hiking trail, but local guidance may be needed. Site open, tower closed. ARLHS JPN-372; JCG-0956.1; Admiralty M7283.62; NGA 2332. Date unknown. Active; focal plane 13 m (43 ft); red light, 3 s on, 3 s off. 8.5 m (28 ft) concrete post attached to a 1-story concrete equipment shelter. Entire lighthouse is red. Lighthouse Visit has a page with a photo (bottom of the page), and Google has a satellite view. This light has been relocated recently from the north inner breakwater, where it appears in the 2010 photo from FOAL. Located on the outer breakwater of Moroyose harbor. Site status unknown. ARLHS JPN-870; JCG-0957; Admiralty M7283.7; NGA 2336. 1972. Active; focal plane 74 m (243 ft); white light occulting twice every 6 s. 10 m (33 ft) round cylindrical concrete tower, attached to a 2-story equipment shelter (an inactive spotlight in the upper story formerly illuminated on a nearby reef). Entire lighthouse is white. A photo is at right, Lighthouse-Japan.com has a page with photos, Lighthouse Visit has photos (top of the page), Misty's Tour has photos, another photo is available, Naoyuki Sakai has a distant view from the beach, and Google has a satellite view. NGA lists the light as Yazyoga Hana. Located on a promontory at Hamasaka, about 3 km (2 mi) east of Moroyose. Accessible by a short walk from the harbor along a forested ridge. Site open, tower closed. ARLHS JPN-1547; JCG-0958; Admiralty M7283.57; NGA 2340. 2005 (station established 1960). Active; focal plane 13 m (43 ft); red light occulting once every 4 s. 10 m (33 ft) round concrete tower attached to a small equipment shelter. Entire lighthouse is red. Lighthouse Visit has photos (middle of the page), and Google has a satellite view. This light was relocated from the North (Inner) Breakwater; Google has a distant 2013 street view of the lighthouse at its former location. NGA misspells the name of the town "Hamaska." Located at the east end of the north detached breakwater at the entrance to Hamasaka harbor. Accessible by walking the pier. Site open, tower closed. JCG-0959; Admiralty M7283.58; NGA 2348. Date unknown. Active; focal plane about 13 m (43 ft); green light, characteristic unknown. Approx. 10 m (33 ft) post centered on a square 1-story equipment shelter. Entire lighthouse is white. Lighthouse Visit has photos (bottom of the page), and Google has a satellite view. Located at the west end of the northeast breakwater. Accessible only by boat. Site open, tower closed. JCG-0960; Admiralty M7283.59. Date unknown. Active; focal plane 71 m (233 ft); white flash every 4 s. 8.5 m (28 ft) round cylindrical concrete tower with gallery adjoining a 1-story equipment building. Entire lighthouse is white. A distant view (fourth photo on the page) is available, and Google has a satellite view. Located on a small island off Mio, a tiny village about 15 km (9 mi) northwest of Hamasaka. Accessible only by boat. Site status unknown. ARLHS JPN-357; JCG-0961; Admiralty M7283.52; NGA 2352. 1985 (station established 1951). Active; focal plane 284 m (932 ft); white flash every 15 s. 14 m (46 ft) round cylindrical concrete tower with lantern and gallery, attached to a 1-story equipment building. 2nd order Fresnel lens in use. Entire lighthouse is white. A photo is at the top of this page, Lighthouse-Japan.com has photos, Lighthouse Visit has a page with photos, Kiso has an excellent photo, Misty's Tour also has a photo, and Google has a street view and a satellite view of the station. NGA lists an "octagonal metal tower," which may describe the original lighthouse. This is Japan's highest lighthouse. Located on a prominent cape about 10 km (6 mi) west of Kasumi. Accessible by a twisting mountain highway; parking provided. Site open, tower closed. ARLHS JPN-019; JCG-0963; Admiralty M7283.5; NGA 2360. Date unknown. Active; focal plane 11 m (36 ft); red light, 2 s on, 2 s off. 10 m (33 ft) round red concrete tower mounted on a large square concrete base. Lighthouse Visit has photos (top of the page), and Google has a satellite view and a very distant street view. Located at the end of the south breakwater of Kasumi's Shiroyama harbor. Site status unknown. ARLHS JPN-1532; JCG-0967; Admiralty M7282; NGA 2392. Date unknown (station established 1949). Active; focal plane 13 m (39 ft); green flash every 3 s. 10 m (33 ft) round hourglass-shaped white concrete tower. Lighthouse Visit has photos (second lighthouse on the page), and Google has a satellite view. NGA formerly listed an octagonal tower for this light. 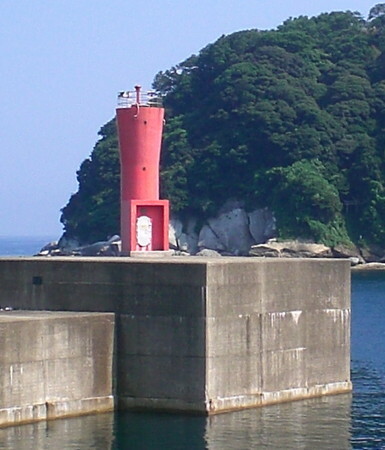 Located at the end of the north breakwater of Kasumi's Shiroyama harbor. Accessible by walking the pier. Site open, tower closed. ARLHS JPN-1531; JCG-0968; Admiralty M7283; NGA 2396. 1949. Active; focal plane 88 m (289 ft); white light, 3 s on, 3 s off. 6.5 m (21 ft) concrete post adjoining a 1-story concrete equipment shed. Entire lighthouse is white. Lighthouse-Japan.com has a page with photos, Lighthouse Visit has photos (last lighthouse on the page), Misty's Tour has a photo, another photo is available, and Google has a satellite view. Located on a steep bluff on the east side of the entrance to Kasumi harbor. Accessible by a short, steep trail, bit local guidance will be needed. Site open, tower closed. ARLHS JPN-242; JCG-0969; Admiralty M7281; NGA 2376. Date unknown. Active; focal plane 17 m (56 ft); continuous red light with a more intense flash every 4 s. 9.5 m (31 ft) round concrete tower with a flared top, attached to a small equipment shelter. Entire lighthouse is red. A photo is at right, and Google has a satellite view and a very distant street view. Located at the end of the main breakwater of the newer harbor of Kasumi. Probably accessible by walking the pier. Site open, tower closed. ARLHS JPN-1502; JCG-0970.3; Admiralty M7281.5; NGA 2380. Date unknown. Active; focal plane 12 m (39 ft); red flash every 3 s. 10 m (33 ft) concrete post attached to a square 1-story equipment shelter. Entire lighthouse is red. Google has a street view and a good satellite view. Located at the end of the old north breakwater of Kasumi. Probably accessible by walking the pier. Site open, tower closed. ARLHS JPN-1503; JCG-0971; Admiralty M7283.3; NGA 2384. 1933. Active; focal plane 99 m (325 ft); white light occulting once every 4 s. 9.5 m (31 ft) concrete post centered on a 1-story concrete equipment building. Entire lighthouse is white. Another photo is available, and Google has an indistinct satellite view. Located on a high hill on the west side of the entrance to Shibayama. Site open, tower closed. ARLHS JPN-555; JCG-0973; Admiralty M7280; NGA 2400. 1962. Active; focal plane 12 m (39 ft); red flash every 5 s. 9.5 m (31 ft) concrete post attached to a 1-story concrete equipment shelter. Entire structure is red. Lighthouse Visit has photos (second lighthouse on the page), and Google has a satellite view. Located at the end of the west (main) breakwater of Shibayama. Accessible by walking the pier. Site open, tower closed. ARLHS JPN-1503; JCG-0974; Admiralty M7280.4; NGA 2408. Date unknown. Active; focal plane 14 m (46 ft); green flash every 3 s. 10 m (33 ft) round concrete tower with a flared top, attached to a small equipment shelter. Entire lighthouse is white. Lighthouse Visit has photos (third lighthouse on the page), and Google has a satellite view. Located on a detached breakwater on the east side of the approach to Shibayama. Accessible only by boat. Site open, tower closed. JCG-0975.2; Admiralty M7280.7; NGA 2402. 1965. Active; focal plane 11 m (36 ft); continuous green light with a more intense flash every 5 s. 8.5 m (28 ft) concrete post attached to a 1-story concrete equipment shelter. Entire structure is white. Lighthouse Visit has photos (last lighthouse on the page), and Google has a street view and a satellite view. Located at the end of the north (main) breakwater at Takeno, a small port on the west side of the base of the Neko Saki peninsula. Accessible by walking the pier. Site open, tower closed. ARLHS JPN-1793; JCG-0978; Admiralty M7279; NGA 2416. 1961. Active; focal plane 43 m (141 ft); two white flashes every 7 s. 10 m (33 ft) round cylindrical concrete tower. Entire lighthouse is white. Lighthouse-Japan.com has a page with a good photo, another photo is available, and Google has a satellite view. Located at the end of a narrow peninsula projecting into the Sea of Japan northeast of Shibayama. Site open but difficult to reach, tower closed. ARLHS JPN-406; JCG-0979; Admiralty M7278.6; NGA 2412. Date unknown. Active; focal plane 46 m (151 ft); white flash every 4 s. 9.5 m (31 ft) concrete post centered on a 1-story concrete equipment building. The square box on the right side of the tower contains a spotlight (JCG-0981) that shines on a nearby reef. Entire lighthouse is white. Lighthouse-Japan.com has a page with good photos, Lighthouse Visit has photos (first lighthouse on the page), a closeup photo is available, the Misty's Tour photo shows the spectacular site of this little lighthouse, and Google has a satellite view. Located on a steep slope on the west side of the entrance to the fjord of Tsuiyama, a narrow cleft in the rugged coast. Local knowledge will be needed to find the trail to this lighthouse. Site open, tower closed. ARLHS JPN-537; JCG-0980; Admiralty M7276; NGA 2428. Date unknown. Active; focal plane 12 m (39 ft); red light, 3 s on, 3 s off. 10 m (33 ft) round red concrete tower. Lighthouse Visit has photos (second lighthouse on the page), Google has a satellite view. This light marks the end of a longitudinal pier that divides Tsuiyama harbor. Accessible only boat. Site open, tower closed. ARLHS JPN-1528; JCG-0982; Admiralty M7277; NGA 2432. 1964. Active; focal plane 56 m (184 ft); white light, 3 s on, 3 s off. 10 m (33 ft) round hourglass-shaped concrete tower, covered with tiles colored white with one red horizontal band. A photo is at right, Lighthouse-Japan.com has a page with several photos, Lighthouse Visit has photos (last lighthouse on the page), Misty's Tour has additional photos, another photo is available, a page has photos and an account of a visit, and Google has a satellite view. Located at the tip of a very sharp promontory on the east side of the entrance to Tsuiyama. Accessible by a rugged hike of about two hours round trip; the Misty's Tour author writes, "I was tired from ups and downs very much." Site open, tower closed. ARLHS JPN-604; JCG-0985; Admiralty M7275; NGA 2440. Sakaiminato Station, Sakaiminato, has an interesting faux lighthouse above the entrance. Another photo is available. Google has a street view and a satellite view. Tottori Lighthouse Park, Tottori, has what appears to be a functional lighthouse, but it's not known if it is active. A photo and a second photo (second photo on the page) are available, and Google has a street view and a satellite view. Posted February 28, 2007. Checked and revised July 18, 2018. Lighthouses: 39. Site copyright 2018 Russ Rowlett and the University of North Carolina at Chapel Hill.